This Caramel Apple Cake is ridiculously easy to make but tastes like you spent all day baking! Made with 3 simple ingredients that you dump in a cake pan and bake, dessert doesn’t get any easier. In my mission to enjoy life to the fullest, I’m always looking for ways to do things that will bring happiness to others without leaving me exhausted or frustrated. A 3-ingredient dessert that leaves guests licking their lips and patting their stomachs with satisfaction? 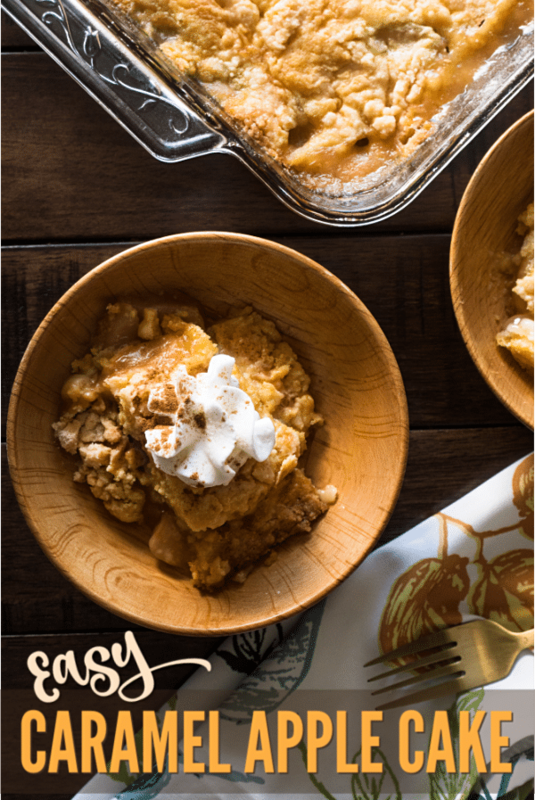 This caramel apple dump cake is a star example of my life goals. 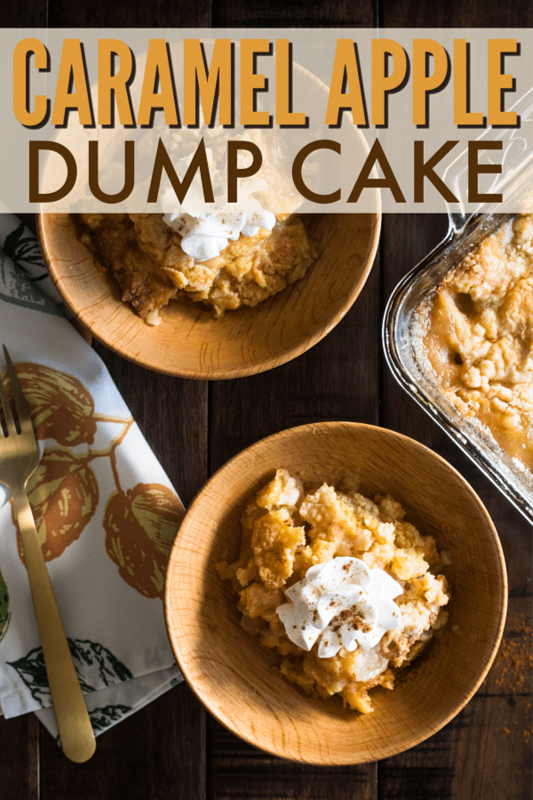 This Caramel Apple Cake is a dump cake. 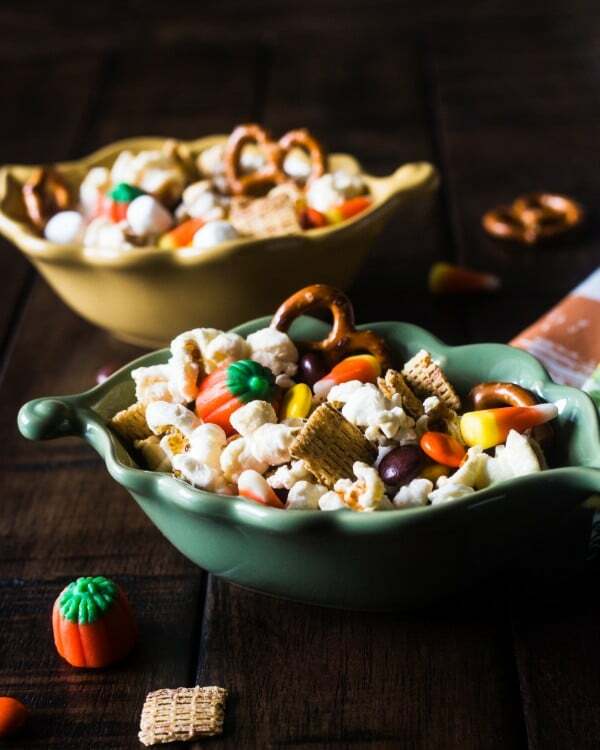 You just dump the ingredients in a baking dish, no stirring required. 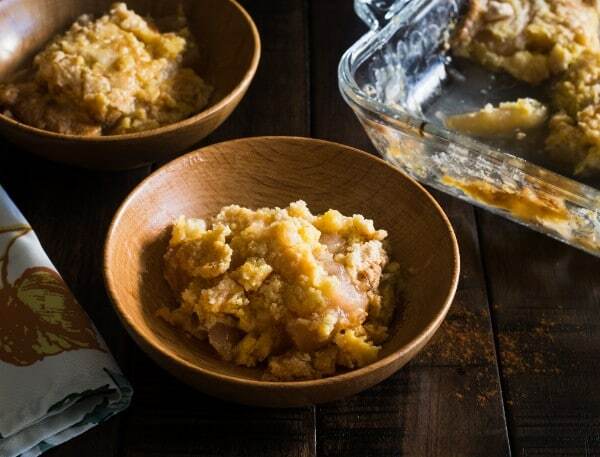 Even better, you only need 3 ingredients — caramel apple pie filling, golden butter cake mix and butter. 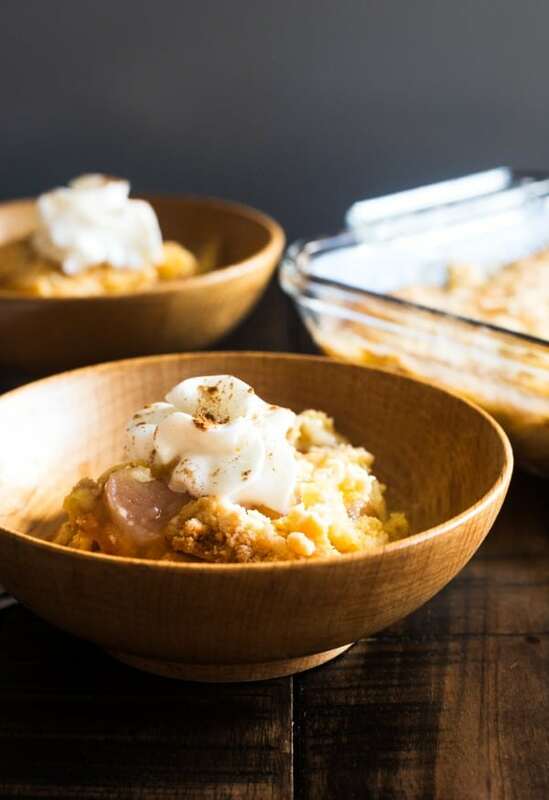 We get to skip most of the hard work in this recipe by replacing fresh apples that we would have to peel, slice, and boil in sauce ingredients with store-bought caramel apple pie filling. 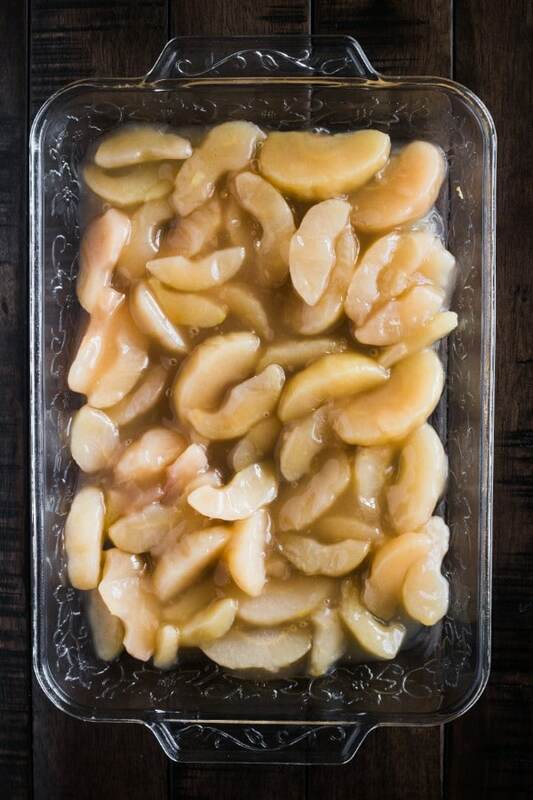 If you prefer to make your own pie filling, try this Homemade Caramel Apple Pie Filling recipe from Genius Kitchen. 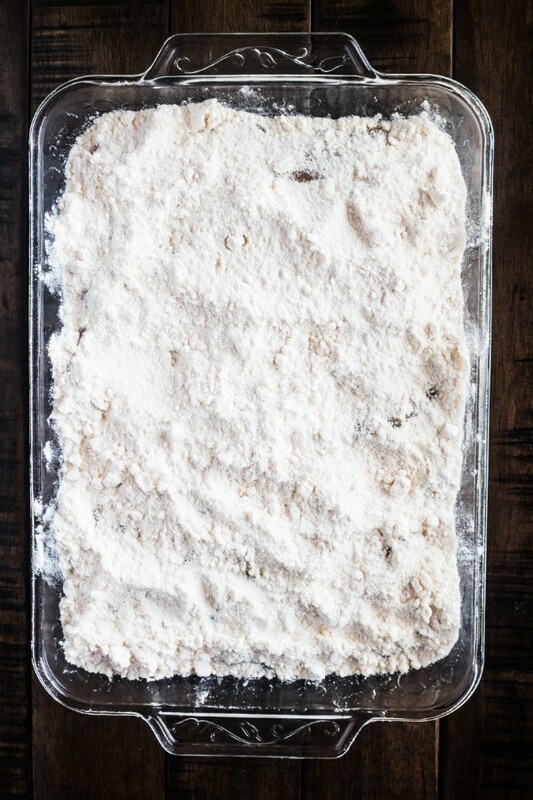 Simply pour the pie filling into a greased 9×13 inch baking dish and spread evenly so that the pie filling covers the bottom of the dish. Next, we’re going to cover the layer of pie filling with a layer of golden butter cake mix. Again, if you prefer homemade, you can substitute a homemade cake mix like this Homemade Yellow Cake Mix from Simply Scratch. Finally, we’re going to top the cake mix with pats of butter. I’m slightly OCD so I like to make nice rows and columns, but you can just sprinkle them on. Do try to spread them out over the entire top of the cake though. Now, we’re going to let the oven do the rest of the work. Pop the baking dish into a 350-degree oven for 40 minutes. That’s it! Your caramel apple cake is ready to serve! If you want, top with a scoop of ice cream or a dollop of whipped cream. Easiest dessert ever, right? Shhh, no one needs to know you didn’t spend hours on it! Because this Caramel Apple Cake is so easy to make, you’ll want to make it again and again. 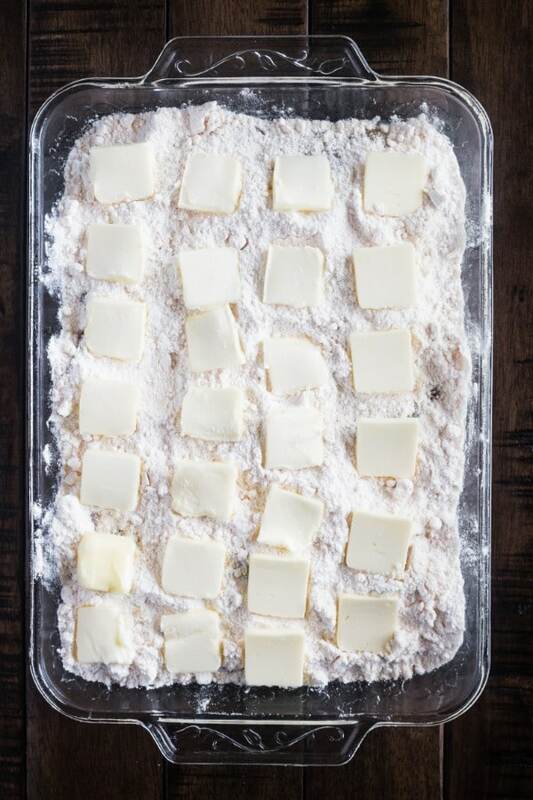 Bookmark this page or print off the recipe to keep in your recipe box. Add pie filling to baking dish and spread into an even layer that covers the bottom of the dish. Sprinkle entire box of cake mix over the pie filling. Bake for 40 minutes. Test for doneness by inserting a toothpick into the center of the cake. It should come out clean (though the tip may have some pie filling on it). 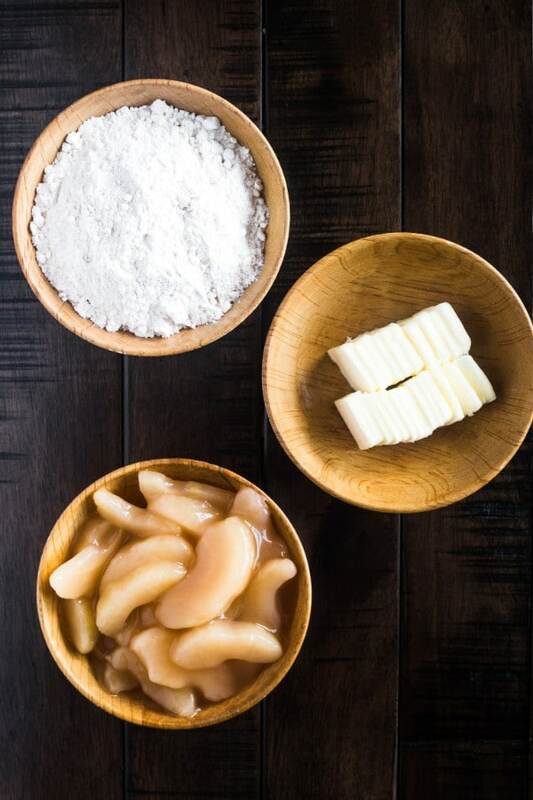 Notes: You can easily reduce the sugar in this recipe by using sugar-free apple pie filling instead. You can also replace the golden butter cake mix with yellow cake mix or vanilla cake mix. 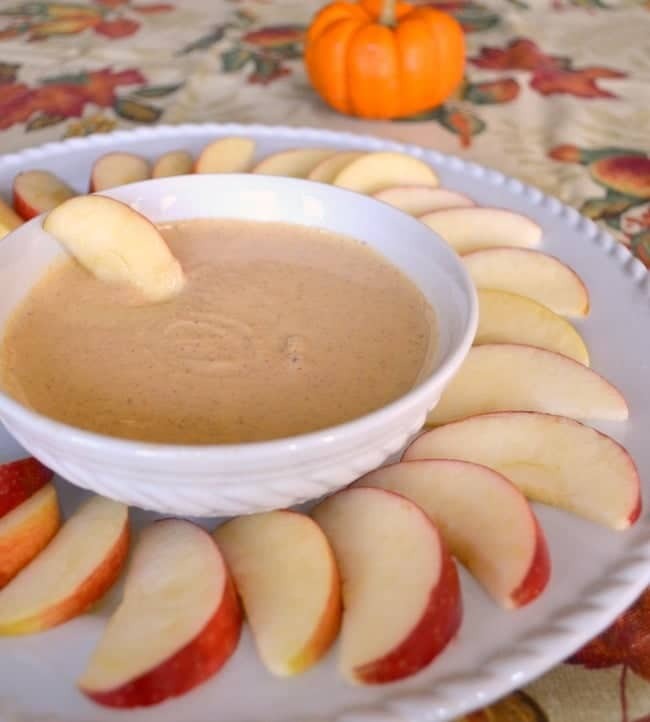 If you enjoyed this recipe, you might like some of my other easy Fall recipes.